Dads had a good year in film in 2018. That’s why we put together the 10 Best Dad Movies of 2018 to help you narrow down your list of must-sees. The range of dads portrayed in film was a solid cross-section of reality. There were outdoor dads, meta dads, rich dads, poor dads, dead-beat dads, loyal dads, drunk dads, and sober dads. The one thing they all had in common was they struggled with their flaws to redeem themselves for their families. Some dads were successful and others not. All were challenged to redefine what it means to be a parent, and that’s something all dads will relate to. Below, in roughly descending order, are the 10 Best Dad Movies of 2018 that’ll transport anyone, dad or not, on vicarious journeys in parents’ shoes. Leave No Trace is simply a great film. Great writing. Great acting. Great filming, Timely story. Challenging material. And it just so happens to be a story of a father and daughter, so it makes our list of best dad movies of 2018. The mighty Ben Foster plays a war vet who lives off grid with his daughter for years in the forests outside Portland, Oregon. After being discovered one day, they get placed in social services, and spend the rest of the film fighting their way back to live in the wild on their own terms again. Much less playful than Captain Fantastic from 2016, and as a result, this film comes across as more real and more engaging. So good it tops our list of must-see movies from 2018. Wildlife is a heart-wrenching work of art depicting a Montana family in the 1960s dealing with the cultural changes of the time. Definitions of happiness, family, and roles of genders in the home are all in flux. Things get more complicated when Jake Gyllenhaal’s character loses his job and leaves his family behind to fight a forest fire threatening their town. While away, Gyllenhaal’s 14-year-old son watches his mother get involved with another man who could provide the stability his family needs. It’s a story that weaves together the roles of father, son, and lover so deftly, you can’t help but see yourself in all roles at once. You’ll be left to wonder if you wouldn’t have made the same choices each character makes. There are, literally, many dimensions to Spider-Man: Into The Spider-verse. Sure, the latest Spider-Man movie tells the story of the Webbed Wonder fighting villains. King Pin, Green Goblin, and Dr. Octagon fill up much of the storyline. But, it’s also a coming-of-age story about a young Spider-Man learning to take a leap of faith into adulthood. There’s also another layer to the story where multiple Spider-people live in other dimensions that all converge and have to work together to re-establish peace in New York again. But, peel back all those layers of this story, and at its heart is a beautifully crafted tale of the relationship of the boy Miles Morales, the new Spider-Man, and his father. His father works through letting go of his demanding expectations of his son while his son works through admitting how much he loves and needs his father. The Spider-Man saga has always focused on Peter Parker’s relationship with his uncle, which is a strong story, but this new layer of the father-son relationship takes it to a new, even more powerful level for dads in the audience. Black Panther easily makes the list of best dad movies of 2018. Black Panther is the ninth highest-grossing film of all time, so you’ve probably already seen it and there’s no point in telling you the plot. But, I will anyway. At the heart of this groundbreaking superhero story is a classic father-son story. After his father dies, T’Challa must take his place as king back home in the African nation of Wakanda. T’Challa is thrust into battle over some short-sighted mistakes his father made in his younger days. The new king must right his father’s wrongs, defeat a badass foe, and define a more righteous path for his people. Get the antiperspirant out. A Quiet Place will have you sweating from the opening scene. A survivalist horror story reminiscent of The Walking Dead, it’s a story of a family who lives in a very scary world in the near future. Scary because most of the human and animal population has been wiped out by blind monsters with hypersensitive hearing. The slightest sound launches them into search-and-destroy mode, and they almost always find their prey. 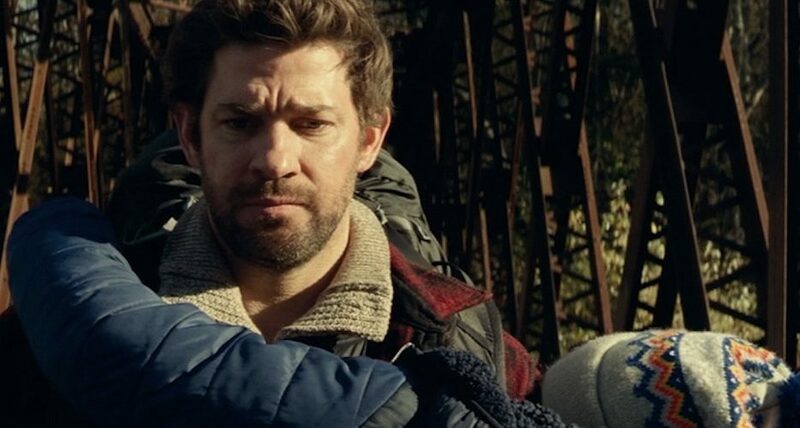 Emily Blunt is powerful as the mother, but this film makes the list of best dad movies of 2018 for John Krasinski’s role as the father. Krasinski is tasked with raising a family and keeping them safe in a horrifying and dangerous world. Dads, you’ll relate. Provided you’re not a flat-earther or a moon-landing denier, you’ll flip for First Man. It’s the story of Neil Armstrong’s mission to be first to land on the moon. And it is riveting. Even though we all know how the story goes, the threat of danger infuses every well-crafted second of this film and keeps you on the edge of your seat. The danger hits home especially close for all us dads as we watch Ryan Gosling’s Armstrong tell his kids he might not return home from space alive. Think about that one. How composed would you be if you had to tell your kids you might never see them again? If you want a heartwarming story about a father and daughter who overcome differences and learn to love each other, this is not it. Searching is a nail-biting thriller that preys on your fatherly instincts and will haunt you for weeks. John Cho (yes, of Harold and Kumar fame) plays a dad who’s 16-year-old daughter goes missing. When the police investigation turns up nothing, the dad digs into his daughter’s laptop to trace her digital footprint. Thinking this is just another found-footage movie? Well, it’s not. It’s smart, well-written, and will keep you glued to the screen from start to finish. Critics call Love, Simon a John Hughes film for the next generation. That’s a cut-down in my book. It’s not quite that saccharine. Love, Simon is much deeper and more authentic than a Hughes film. If we’re going to compare it to the 80s, it fits Cameron Crowe’s well-rounded Fast Times at Ridgemont High much better. Funny, edgy, terrifying, and ultimately life-changing, it’s the story of a high school kid who hasn’t told his parents or even his friends he’s gay. Josh Duhamel plays the father who must blindly navigate along his son’s path to graduation and adulthood, and arrives at whole-hearted acceptance of him. Like Father squeaks into the bottom of the list of best dad movies of 2018 because it’s just so damned sweet. Written and directed by Lauren Miller, it stars a solid cast with Kelsey Grammer, Kristen Bell, and Seth Rogen. After her betrothed takes a hike on their wedding day, Kristen Bell’s character says f*ck it and decides to go on her honeymoon cruise anyway. There’s one little hiccup, though. She brings her estranged dad along for the ride after getting ripped with him the night before. Stuck on a boat together, they’re forced to chip away at the wall they’ve built in between each other for so long. We’ve got some action movies, some horror, some sweet aww-worthy movies, so we’re rounding out the list of best dad movies of the year with a comedy. Father of the Year is about the mayhem that ensues when two college graduates debate whose father would win in a fight. Yes, it’s a ridiculous plot, and yes, it’s got David Spade playing a version of Joe Dirt, but it’s got some funny moments that’ll fill those late nights when your kid is sick and you can’t get back to sleep. Now, none of these movies will give you guidance on how to be a better parent. (Although, most are great guides for what NOT to do as a dad.) So, if you’re looking for a little help in the dad-ing department, check out the 5 Best Websites For Dads.